There are many appealing benefits to becoming a contractor, including enjoying the freedom of being your own boss and having the ability to charge clients what you think you are really worth. Before working as a contractor, you should consider whether you have the skill set and knowledge to succeed working for yourself. While supply and demand will drive the market for contractors of all abilities, those with more transferable skills are in high demand, and those with vast experience will tend to land the more lucrative contracts. What level of skill is needed to succeed in my industry? Will the advantages of contracting outweigh the disadvantages of contracting for me? For anyone thinking of becoming a contractor, there are a number of things to consider before handing in your notice. You should question: How will I get my next contract? How will I get paid? How will I be taxed? It’s probably an oversight for many people considering a career working as a contractor, but it is important that you are insured for a number of reasons. Apart from covering your back, many employers will not consider you without it. There are various types of business insurance policies available for contractors, designed to cover a wide range of risks, dependent on the industry you will be working in. 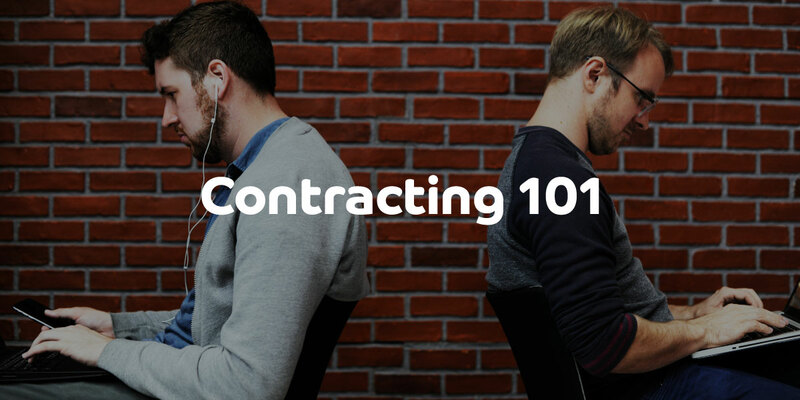 For all contractors the biggest hurdle is always securing your first contract. As a rule of thumb, contractors generally begin applying for new contracting roles around two to three weeks before their current role ends. If you are moving from permanent to contracting, it’s wise to research what jobs are available before leaving your current position. In either case, it’s probably a good idea to have some money set aside in case you do not move from a permanent position to a contract job immediately. Depending on how you set up as a contractor you will need to create invoices to ensure you are paid by your client on time. Whilst there are various software packages and tools available, you will also need to think about time allocated to this. Spending too much time organising your paperwork or chasing late or unpaid invoices can be frustrating and take the focus away from what you enjoy doing – your contracting work. If you process your own invoices, these will need to include all relevant and important information such as; your name, business name, business address, and, if you are a limited company, your company registration number. You may also be VAT registered. If so, this will also need to be stated, along with your VAT number. Our free invoice template is easily editable and is ready to send to clients – download it here. Whilst setting up as an independent contractor will require a large investment of time and energy, and focus on new tasks like keeping up-to-date with tax legislation, it will be a rewarding journey. When you begin working as a contractor you’ll discover that this can be the most effective way of making money, not only that but an enjoyable career move, due to working with a variety of projects and teams. You will develop new skills and relationships, and soon find the rewards are more than just financial. At ContractingWISE, we are always here to help. To find out more about becoming a contractor, read our guide here. To get going straight away, download and complete our free contracting checklist here. You can contact us by calling 0203 642 8679 or request a free call back.